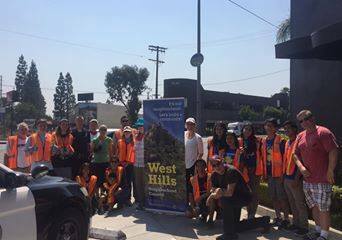 The West Hills Neighborhood Council’s Beautification Committee, headed by Reeyan Raynes and Tony Brosamle, organized another successful Community Cleanup on June 25 along the west side of Topanga Canyon Boulevard between Nordhoff and Gresham Streets. Crucial support came from hard working neighbors and volunteers from the El Camino Real High School ?‎Key Club, the Kiwanis Club of Warner Center-Woodland Hills and Chaminade College Preparatory High School, among other groups. LAPD Senior Lead Officer Sean Brown provided traffic control to ensure the safety of the volunteers and also pitched in with a shovel.